It’s now become an official tradition for friends and me to drive to the Sierra Foothills for some wine-tasting on the Saturday immediately after Thanksgiving. We had a smaller group than usual in 2010, and on this trip only Grape-Nutz veterans Eric Lundblad and Alan Garretson were able to join me. The lengthy drive from the Bay Area makes for a short day in the Foothills, but even so, we hit a new low in number of wineries visited – just two this time, both in El Dorado County. 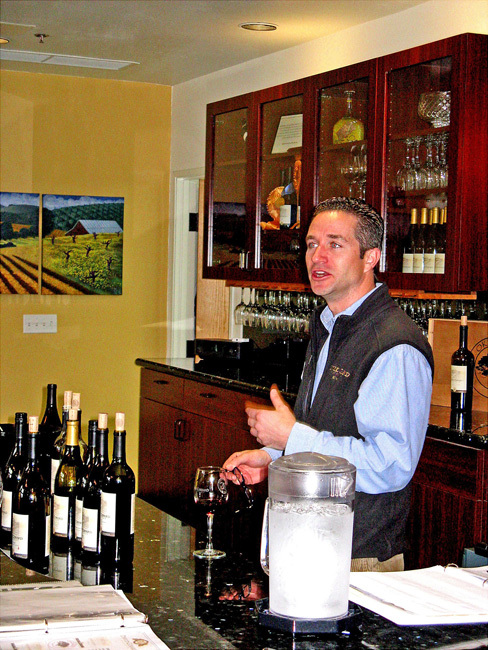 One was a winery that none of us had visited before – David Girard – while the other was an old favorite, Cedarville. As we weren’t scheduled to get to our first stop until 11am, we were able to start our drive at a civilized hour on this trip. We drove past Sacramento and up into the Sierra Foothills, through a rain that wasn’t especially heavy but which was certainly persistent. Exiting the freeway in Shingle Springs, a few miles west of Placerville, we headed north along several two-lane roads until we arrived at the entrance to David Girard Vineyards. 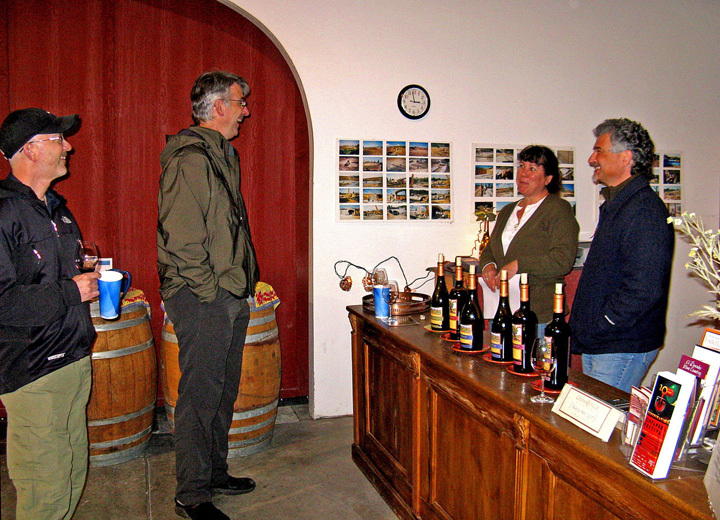 General Manager Chris Mericle greeted us as we walked into the tasting room. I’d met Chris at a Sierra Foothills wine tasting event a few months earlier, where the David Girard wines were some of the standouts of the day. 2008 Viognier, Estate, El Dorado: 100% Viognier. Light color, aromas of tropical fruit along with some citrus and a leesy note. Some mineral and spice character shows up in the mouth, and there’s a bright acidity on the finish. 2008 “Coda Blanc,” Estate, El Dorado: 45% Roussanne, 21% Rolle, 16% Marsanne, 13% Grenache Blanc, 5% Viognier. Slightly lighter color than the Viognier, with stone fruit, spice, and dried herbs on the nose. Showing a similar streak of acidity on the palate as the Viognier, there was a slight touch of bitterness in the finish. 2008 Viognier-Roussanne, Estate, El Dorado: 71% Viognier, 29% Roussanne. Light color, with apricot, honeysuckle, and a big spice component. Bigger in the mouth than the first two wines, with a richer and smoother finish. 2009 Grenache Blanc, Estate, El Dorado: 100% Grenache Blanc. Very light color, showing pear and exotic floral and spice aromas. Very nice texture on the palate, with crisp acidity and clean finish, a different and appealing rendition of Grenache Blanc. 2009 Roussanne, Estate, El Dorado: 86% Roussanne, 14% Marsanne. Light straw color, tropical fruit and lots of spice on the nose. Rich and viscous mouthfeel with plenty of acidity to balance it out, and a long, tasty finish. 2008 Rosé, Estate, El Dorado: 47% Grenache, 39% Mourvèdre, 14% Counoise. Light pink/salmon color, displaying lightly spicy watermelon, very dry and crisp, nice texture in the mouth with a hint of tannin on the finish. 2008 Grenache, El Dorado: 100% Grenache, sourced from the estate vineyard and nearby Goldbud Farms. Medium-light ruby color, intense and almost Pinot-like aromatics, with bright cherry and raspberry and lots of spice. Lighter-bodied, with a mineral note on the palate, and moderate tannins on the finish, very tasty. 2006 “Coeur Rouge,” Estate, El Dorado: 44% Mourvèdre, 28% Grenache, 22% Syrah, 6% Counoise. Medium-light color, complex nose of earth/funk, black cherry and plum, grilled meat, and spice. Bright acidity in the mouth, with a more grippy finish than the Grenache. 2008 Syrah-Grenache-Counoise, Estate, El Dorado: 50% Syrah, 42% Grenache, 8% Counoise. Medium color, noticeably more fruit-forward in style, showing ripe raspberry and clove aromas. Somewhat richer mouthfeel, with medium tannins. 2007 Syrah, El Dorado: 100% Syrah, sourced from the estate vineyard plus nearby Wylie and Fenaughty vineyards. Medium color, smoky plum and herb aromas were prominent, with some savory notes and an underlay of vanilla/oak. Hints of iron came through in the mouth, and the finish was lively, with a moderate tannic grip, quite nice. 2008 “Rive d'Or,” El Dorado: 67% Cabernet Sauvignon, 28% Merlot, 5% Malbec. Medium-dark color, dark fruits, nutmeg and clove, tobacco, and vanilla/oak all show up on the nose. Fairly big and brawny on the palate, with chewy tannins on the finish. 2008 Mourvèdre, Estate, El Dorado: 100% Mourvèdre. Medium garnet color, with very smoky plum, earth, and clove/spice notes. Mouthfilling texture, with some rough, youthful tannins that will need some time to smooth out. 2005 “Rive d'Or,” El Dorado: 83% Cabernet Sauvignon, 12% Malbec, 5% Merlot. Medium-dark color, displaying aromas of cassis, dried herbs, and olives. Good acidity balanced the rich mouthfeel, and not surprisingly, the tannins are rounder and more resolved than the ’08 version. 2008 “Okei-San” Syrah, Estate, El Dorado: 94% Syrah, 6% Viognier. Medium-dark color, with dark berry fruit, grilled meat, and cloves, along with a bigger component of sweet oak than the regular Syrah. The Viognier gave this an aromatic “lift” rather than any obvious floral character. Some mineral notes appeared on the palate, and the finish was fairly tannic. Definitely a wine that will benefit from time in the cellar. The winery and tasting room are located among rolling hills just a few miles from historic Coloma, where James Marshall discovered gold in the American River in 1848. Winery owner David Girard, an attorney originally from the Detroit area, purchased the 80-acre property in 1996. Through a friend’s connection with Robert Mondavi Winery, David first planted Merlot on the property as Mondavi was looking for a Merlot source from El Dorado. The initial planting was in 1998, followed by more vines in 2001. Chris told us that it was around this time that David accompanied vineyard manager Ron Mansfield – who farms the well-known Wylie and Fenaughty vineyards among others – and Steve Edmunds of Edmunds St. John Winery on a trip to the Rhône Valley. The trip convinced David that Rhône varieties were better-suited to his vineyard, and most of the original Merlot plantings have now been grafted over to other varieties. About 40 acres are now planted on the hilly site, which ranges from about 1,200 to 1,500 feet in elevation. The soil is loamy decomposed granite, which drains very well. Among the varieties currently planted are Grenache, Syrah, Mourvèdre, Counoise, Viognier, Roussanne, Marsanne, Grenache Blanc, and Rolle (Vermentino), along with some Merlot. Many of the vines are head-trained. About 95% of the fruit that goes into the David Girard wines now comes from their estate vineyard. 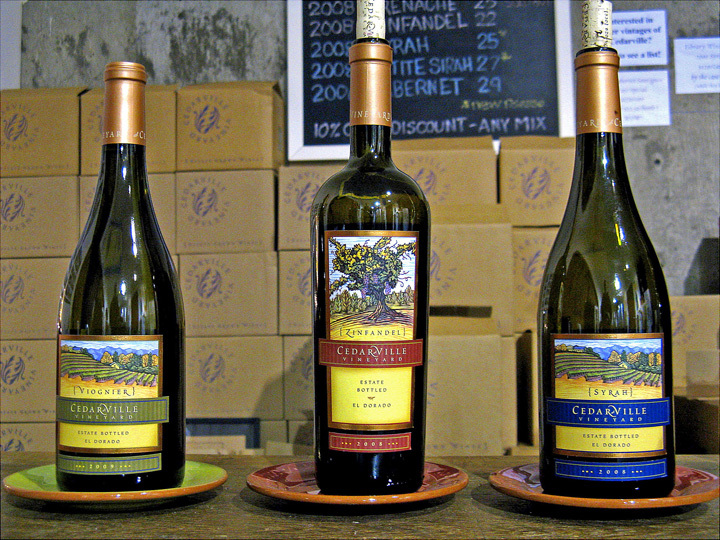 The winery’s first vintage was in 2001 – that and the following two vintages were made in Napa. 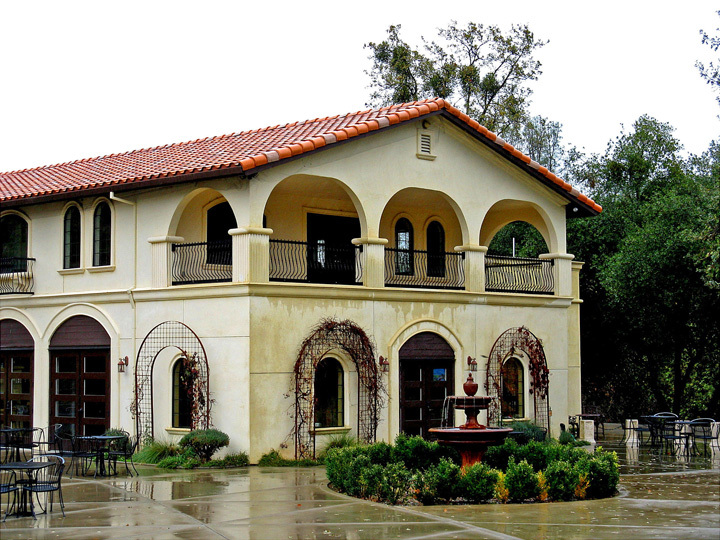 In 2004, the current winery was completed and winemaker Mari Wells Coyle came on board. Mari earned a degree from UC Davis after studying viticulture and enology there. She’s a Pinot Noir fan and worked with Merry Edwards and Gloria Ferrer in Sonoma County. After working briefly in New Zealand, Mari returned to California and settled in the Sierra Foothills, where she worked at Chatom Vineyards in Calaveras County prior to becoming the David Girard winemaker. Chris also studied viticulture and enology at UC Davis and worked previously at Navarro Vineyards in Anderson Valley, among other places. He moved into a marketing / general manager position, and he noted that it is unusual to have a winery general manager who has a winemaking as well as a business background. Chris has been at David Girard since 2008. The winery’s initial production was about 1,500 cases, and it’s now up to 5,000-6,000 depending on the vintage. About 75-80% of the wine is sold direct to consumers through the tasting room and wine club, while most of the rest goes to restaurants. The spacious tasting room opened in 2005. As Chris took us on a tour of the winery, we could see that the barrel room is just about at its full capacity, and Chris told us that the building will probably be expanded. Stainless steel tanks are outside, under a large overhang that covers the crushpad. Along with the winery and tasting room, there are facilities to host various events on the property – it’s become a popular spot for weddings. 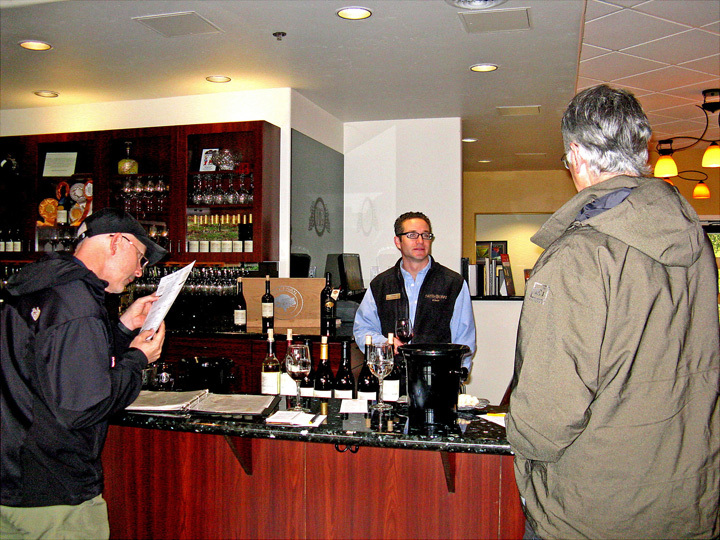 Back in the tasting room, we tasted through the wines with Chris, and he talked with us about some of the winemaking practices. The Viognier is fermented in stainless steel and aged both in tank and in neutral barrels. The “Coda Blanc” white blend is made in much the same way, though a portion of this wine is fermented in neutral oak. Except for the Roussanne, none of the whites go through a full malolactic fermentation. Most of the whites are bottled under screwcap, and Chris told us all the whites will be bottled that way soon. The Rosé is made by crushing the three varieties that go into it (Grenache, Mourvèdre, and Counoise) and letting them cold-soak for 48 hours before pressing off the juice into stainless steel, where it’s all co-fermented. The reds are fermented in ½-ton macrobins and 1-ton t-bins, which all are punched down several times each day. Mari uses a wide variety of cooperages for barrel-aging the wines, and use of new oak is quite limited for all but a few bottlings. The winery almost discontinued their “Rive d’Or” Bordeaux-style blend after 2005 – they made none the following year – but it’s now returned to the lineup alongside the Rhône-style wines. Another bit of local history is reflected in the winery’s “Okei-San” Syrah. The wine is named for Okei Ito, a member of what is believed to be the first group of Japanese settlers in California – and in fact, the first anywhere in North America. In 1869, they established the Wakamatsu Tea and Silk Colony on a site adjacent to what is now David Girard Vineyards. Sadly, Okei died just a couple of years later, at only 19 years old. Her gravesite is nearby, along with several of the colony’s original structures. The winery donates part of the profit from the “Okei-San” bottling to the American River Conservancy Wakamatsu Colony Preservation and Restoration Project. There are plans to make a white “Okei-San” bottling in the future as well. As we tasted and talked with Chris, he asked us what we thought was the “signature” wine or type of wine of the Sierra Foothills, and of El Dorado County in particular. A very good question, and one for which none of us had a ready answer! Zinfandel? Certainly the Sierra Foothills are well-known for Zin, but perhaps Amador County more so than El Dorado. Syrah or other Rhône varieties? This may well be the future of El Dorado wine, based on the very good Rhône-style wines coming from a number of producers – but we weren’t sure they’re really recognized yet as being “signature” wines of the area. With some promising new wineries and other changes in the El Dorado wine region, it may be a few years before an answer to Chris’ question becomes clearer. We tasted through most of the winery’s lineup with Chris – and briefly with David Girard too, as he unexpectedly arrived shortly before we were ready to go. Chris pulled out a few limited-production wines for us to try in addition to the regular bottlings. A few others we didn’t taste included a sparkling wine, Chardonnay, Rolle (aka Vermentino – this limited bottling is 100% varietal), Late Harvest Viognier, and a Mourvèdre-Touriga Nacional dessert wine. I thought a common character to the wines was their bright acidity, lots of spice aromatics, and in some wines, an intriguing minerally component. While I didn’t feel that every wine was a hit, overall the lineup was very solid, and favorites included the 2009 Roussanne, 2008 Grenache, and 2007 Syrah. As with most Sierra Foothills wineries, their prices are bargains compared with most other California wines of similar quality. I’d say that David Girard is part of the top echelon of El Dorado wineries, and one to watch in the future. Leaving David Girard, we headed along scenic roads to Placerville and continued south from there. Since the cold, wet weather precluded a picnic, we opted for lunch at Gold Vine Grill on Grizzly Flat Road in the small town of Somerset, a few miles south of Placerville. Our meal there was very good – I’d recommend this café if you’re in the area – and it was nice to sit and relax in a warm room for awhile. After lunch, it was only about a five-minute drive to our next stop. The rain had let up a bit as we rolled up to Cedarville Vineyard, but we all still made a quick dash from the car into the winery to avoid the drops. Husband and wife team Jonathan Lachs and Susan Marks were there to welcome us into the winery. Although it was certainly cool inside, we were happy to find that it was still noticeably warmer than outside on this chilly autumn day. Things looked pretty clean and quiet inside the winery – I figured that that must mean that all their 2010 wines were already in barrel, but it turned out that they still had two lots of extended maceration Cabernet Sauvignon left to press. 2009 Viognier, Estate, El Dorado: 100% Viognier. Light straw color, the nose was like a minerally lemon-meringue pie, with just a hint of floral notes. The acidity balanced the rich mouthfeel nicely, while the light touch of oak should integrate given a year or two of bottle age. 2008 Zinfandel, Estate, El Dorado: 92% Zinfandel, 5% Grenache, 3% Petite Sirah. Medium-light color, chalky boysenberry and raspberry aromas with undertones of pepper and spice. Medium-bodied with lively acidity on the palate, and moderate tannins on the finish – a fine example of El Dorado Zin. 2008 Syrah, Estate, El Dorado: 96% Syrah, 4% co-fermented Viognier. Medium-dark color, this displayed meaty and spicy dark fruits with notes of dried herbs, iron, and a touch of sweet oak. Good texture in the mouth, with youthful tannins that will need awhile to smooth out. 2001 Syrah, Estate, El Dorado: Medium-dark color, earthy and savory notes came forward, with plum and olive following up. Medium-bodied and smooth, with well-resolved tannins. 2008 Petite Sirah, El Dorado: 95% Petite Sirah, 5% Cabernet Sauvignon. Dark color, with dark berry, herbs, and black pepper aromas. Thick and rich on the palate, with a big, chewy tannic finish. 2006 Cabernet Sauvignon, Estate, El Dorado: 100% Cabernet Sauvignon. Medium-dark color, with black currant, herb, and mineral notes on the nose. Bright and lively mouthfeel, the finish is a bit tangy and not overly tannic, a Cab that’s drinkable now but should age nicely as well. I’ve visited and written about Cedarville several times before – it’s become a regular part of the post-Thanksgiving trip to the Sierra Foothills – so I don’t want to repeat too much from previous reports, but it’s good to present a quick overview. The focus here is on Rhône varieties, plus Zinfandel and Cabernet. After meeting during their studies at UC Davis, Jonathan and Susan bought their property in the mid-1990s, and they produced their first vintage in 1998. The 15-acre vineyard, on decomposed granite soil at an elevation of about 2,500 feet, includes Viognier, Grenache, Mourvèdre, Syrah, Zinfandel, and Cabernet Sauvignon. All of Cedarville’s wines are made from estate-grown fruit except for their Petite Sirah, which is sourced from nearby Naylor Vineyard. It’s no secret that I think Cedarville is consistently among the leaders in quality among Sierra Foothills wineries, and tasting through their most recent releases did nothing to change my mind. Unfortunately for us, the ’08 Grenache – a favorite of mine at a recent tasting – was sold out and not available to taste. But the other wines were very good, and favorites included the 2009 Viognier and 2008 Zinfandel. Jonathan and Susan also had a library wine – their 2001 Syrah – out for tasting. They were selling this by the case, and it’s a terrific bargain for fans of El Dorado Syrah with some age on it. Cedarville continues to produce solid wines that are great values as well. And it doesn’t hurt that Jonathan and Susan are two of the nicest people I’ve met in the wine business – it’s always a pleasure to visit them. Hitting the road after our tasting at Cedarville, we did something a little different than we’ve done on previous trips to the area. Rather than have dinner in the Sierra Foothills before making the long drive home to the Bay Area, we decided to drive partway back and have dinner in Lodi. We chose the Lodi Beer Company, on School Street in the quaint downtown area. Even in cold weather, there’s nothing like a good beer after a day of wine tasting. I thought the beer was fine although the food was pretty standard pub fare, nothing particularly noteworthy. But the dinner stop in Lodi was a great idea in any case since the drive home afterwards was so much shorter and easier. I guess we could be accused of slacking on this trip to El Dorado County, only visiting two wineries, but they were both enjoyable visits and featured some very good wines. After enjoying David Girard’s wines at tasting events, it was nice to finally visit the winery. Their wines and those of Cedarville – along with a handful of others – are helping to give a welcome push to the El Dorado region’s wine quality. As always, thanks to everyone that we visited for being so generous with their time and their wine!